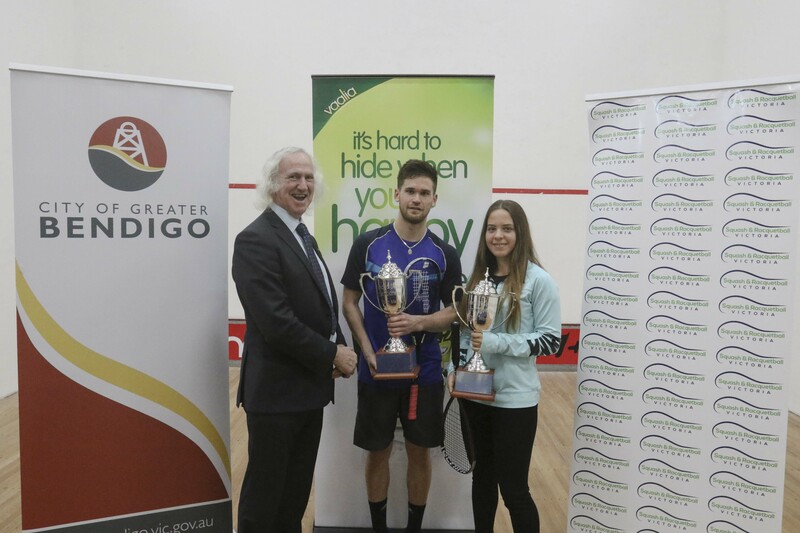 New Zealand’s Evan Williams and Egypt’s Hana Ramadan claimed silverware at the Bendigo International, PSA M5 & W5 tournaments, beating Dimitri Steinmann and Jessica Turnbull, respectively, in the final in Australia. Top seed Williams reached the final of the Men’s event courtesy of wins over Jong Myoung Park, Mithran Selvaratnam and Vincent Droesbeke, the latter of which saw Williams recover from 2-1 down to advance. Steinmann, meanwhile, was appearing in his maiden PSA World Tour final and upset the odds against second seed Elvinn Keo in the last four to seal his final berth. Williams, the World No.87, started on the front foot and rattled off a succession of points as he surged into a two-game lead to put him on the cusp of victory. A determined Steinmann fought back though and dominated games three and four, dropping just three points as he levelled proceedings at the Bendigo Squash Centre to set up a climactic decider. However, Wiliams dug in and wrestled back momentum of the fixture in the fifth game to close out the win with an 11-7, 11-7, 1-11, 2-11, 11-5 scoreline, lifting his fifth PSA World Tour title in the process. Elsewhere, sixth seed Ramadan and home hope Turnbull contested the Women’s final, with Ramadan full of confidence after causing the shock of the tournament in the quarter-final stage with her surprise win over pre-tournament title favourite Millie Tomlinson. World No.89 Ramadan had also staged a superb comeback from two games down to win her semi-final encounter with compatriot and number three seed Nouran El Torky, but showed no signs of fatigue in the final as she powered into a 2-0 lead. Turnbull gained a foothold in the fixture after clawing a game back in the third, but a composed Ramadan held her nerve and the 19-year-old wrapped up the fourth to record an 11-6, 11-4, 9-11, 11-9 triumph that sees her claim a second PSA World Tour crown. French World No.232 Vincent Droesbeke swept to the semi-final stage of a PSA World Tour event for the third time in his career after downing India’s Sandeep Ramachandran in an impressive display in the quarter-final of the Bendigo International, PSA M5 tournament. Droesbeke, 24, captured his maiden PSA World Tour title a fortnight ago in the South Australian Open and he sealed his quarter-final spot in Bendigo courtesy of a gruelling 3-2 win over South Korea’s Ko Youngjo in the previous round. He showed no signs of fatigue against Ramachandran though as a virtuoso display saw him power to an 11-7, 11-6, 11-5 victory to reach the last four. Top seed Evan Williams lies between Droesbeke and a place in the final after the New Zealander bested Mithran Selvaratnam by a 3-1 scoreline. Second seed Elvinn Keo and number four seed Dimitri Steinmann will contest the other semi-final fixture after they defeated Patrick Miescher and Mohamed Saeed, respectively. Top seeds Mille Tomlinson and Siyoli Waters fell to shock defeats in the quarter-final stage of the Bendigo International, PSA W5 tournament after 3-1 losses against Egypt’s Hana Ramadan and South Korea’s Yura Choi, respectively. World No.37 Tomlinson came into her fixture with Ramadan having won her last four PSA World Tour events and the Derby-based 24-year-old has been playing some of the best squash of her career in the midst of a 16-match unbeaten streak. But 18-year-old Ramadan, who is ranked 79 places below Tomlinson in the World Rankings, surged into a two-game lead and, despite dropping the third to a resilient Tomlinson, held off her opponent in a nail-biting fourth game tie-break to close out an 11-8, 11-8, 5-11, 14-12 triumph that leaves her one win away from reaching a second PSA World Tour final. Her semi-final opponent will be number three seed and compatriot Nouran El Torky, who overcame Stephanie Wighton in straight games. Waters, meanwhile, was appearing at her first PSA World Tour event since February, but couldn’t capitalise on a one-game advantage as she eventually succumbed to Choi in four. Choi’s unexpected triumph sends her through to the semi-final where she will do battle with Jessica Turnbull, who will be flying the flag for host nation Australia after she downed India’s Sachika Ingale. Title favourite Evan Williams moved through to the last eight of the Bendigo International, PSA M5 tournament courtesy of a 3-0 triumph over South Korea’s Jong Myoung Park in Australia. The New Zealander had received a bye in the opening round and came into his second round fixture against Park with fresh legs. Game one went in Williams favour by a narrow margin, but he eased to victory in the second game to double his advantage. Williams then held off an improved Park in the third to wrap up the win by an 11-9, 11-3, 11-8 margin and set up a quarter-final clash with Malaysia’s Mithran Selvaratnam, who saw off Remo Handl. Second seed Elvinn Keo will join compatriot Selvaratnam in the next round after he overcame World No.245 Luke Jones. Both players took a game apiece in the early stages before Keo found his rhythm and pulled away in games three and four to ensure that he will take on Switzerland’s Patrick Miescher, with Miescher axing Syed Azlan Amjad in straight games. Meanwhile, India’s World No.273 Sandeep Ramachandran came up with a surprise victory over Ben Grinrod to advance, despite Grindrod sitting 121 places above Ramachandran in the World Rankings. The 19-year-old progresses to face France’s Vincent Droesbeke for a place in the semi-final after he defeated Ko Youngjo 3-2. Dimitri Steinmann and Mohamed Saeed will contest the other quarter-final fixture after respective wins against Daehoon Jeong and Lachlan Coxsedge, the latter of whom was the only Australian left in the tournament. Australian World No.454 Lachlan Coxsedge made it past the opening round of a PSA World Tour event for the first time in his fledgling career after upsetting compatriot David Clegg on home soil on day one of the Bendigo International, PSA M5 tournament. Coxsedge, who sits 261 places below Clegg in the World Rankings, took a shock one-game lead, but normal service appeared to have been resumed when fifth seed Clegg claimed the second for the loss of just three points. But a tenacious display from 17-year-old Coxsedge saw him back in the ascendancy in games three and four to wrap up an impressive 11-8, 3-11, 11-9, 11-9 victory that sees him become the only Australian to reach the second round, where he will be pitted against Mohamed Saeed after the Egyptian dispatched Rohan Toole. Elsewhere, Switzerland’s Dmitri Steinmann sealed his second round berth with a commanding 3-0 triumph over Courtney West and his reward is an encounter with South Korea’s Daehoon Jeong, who overcame Javel Ali in four games. Steinmann’s compatriot, World No.215 Patrick Miescher, will join him in the next round after he surged to a win over Arnold Phat in straight games, while his second round opponent, Qatar’s Syed Azlan Amjad, made short work of Tyler Hawkins. Ko Youngjo and Mithran Selvaratnam were also in action and scored respective wins over Dominique Ratcliffe and TJ French. Youngjo will lock horns with Frenchman Vincent Droeskebe for a place in the last eight, while Selvaratnam will take on Remo Handl.